King Kong was first released in 1933. Still considered one of the greatest movies of all time, it broke ground in many ways. For many of us, it was (like Jurassic Park), the advancements in special effects that set it apart, and I spent many a Saturday afternoon watching the amazing claymation. Thirty years later it was still impressive. Kong has been remade multiple times, and been in several sequels. He's an enduring concept, often considered a take off on Beauty and the Beast (thanks in large part to the final line in the original movie). But I think kids like me loved it for a simpler reason - it was the cool dinosaurs. The newest incarnation came with Kong: Skull Island, released in 2017. While some folks panned it, I rather enjoyed the cinematography, and while my favorite modern version remains Jackson's, I have no ill will toward the new Monsterverse adaptation. All the better, Godzilla is also part of this Monsterverse, and we know we're getting a monster on monster battle royale between these two in 2020. Several companies have picked up the license for Monsterverse properties, including Star Ace. 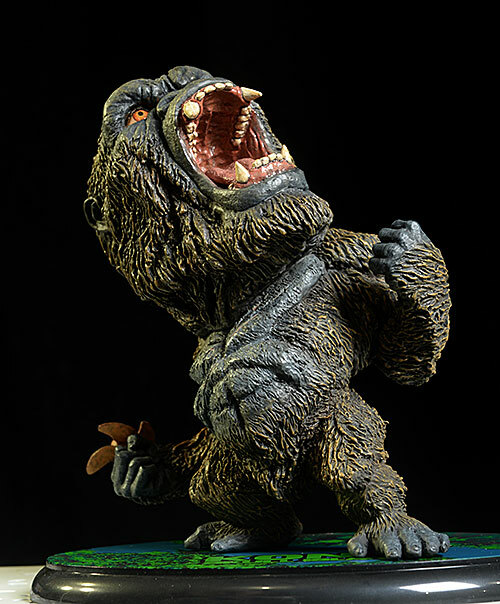 I'm checking out a very early sample of their Deformed Real series of soft vinyl statues - Kong himself, and the sweet looking Skullcrawler. These guys aren't shipping yet, but you can pre-order them for around $50 - $60 each depending on the retailer. This is an early review, early enough that the packaging isn't yet finalized. Star Ace always does a nice job though, so I'm not too concerned. There's several key points to bring up right at the outset. While many of you may know Star Ace for their sixth scale figures, you should also remember that they are an offshoot from X-Plus, a company well known for it's work in vinyl statues. There's plenty of history and experience with the license and the market. This pair are soft vinyl, not polystone or resin. They aren't completely solid, making them lighter in weight than something like a Kotobukiya statue. These are done in a 'deformed' style. It's still life-like in detailing, but the proportions are more like a caricature than a realistic portrait. If you don't like the style, you aren't going to like these. I like what they've done here, particularly with Kong. He stands about 5" tall without the small base, while Skullcrawler is closer to 6". Kong has an oversized head for his body, hence the 'deformed', but the detail work is pretty amazing. The fur flows and layers, and the texture work on the mouth, including the tongue, lips, and roof, is excellent. They eyes are glassy and reflective, and the pose and expression are pure, unadulterated rage. The scars on his chest are deeply cut, and he's grasping a propeller from an unfortunate vehicle in his left hand. The Skullcrawler is also a beautifully textured and nuanced creature. The many rows of deadly teeth look great, as does the entire gaping mouth. The beady eyes are utter malevolence, and the leathery looking skin has a ton of detail work. I think the bony parts of the face could have been a little better, but I'm thinking this is more of a paint issue than sculpt. Both figures come with a stand - more on that in a minute - but they don't require it to stand. The paint work is really solid all around, particularly on Kong. I love the clean, sharp eyes, and the slightly bloodshot appearance adds to the intimidating look. The detail work on the screaming, wet mouth is impressive. 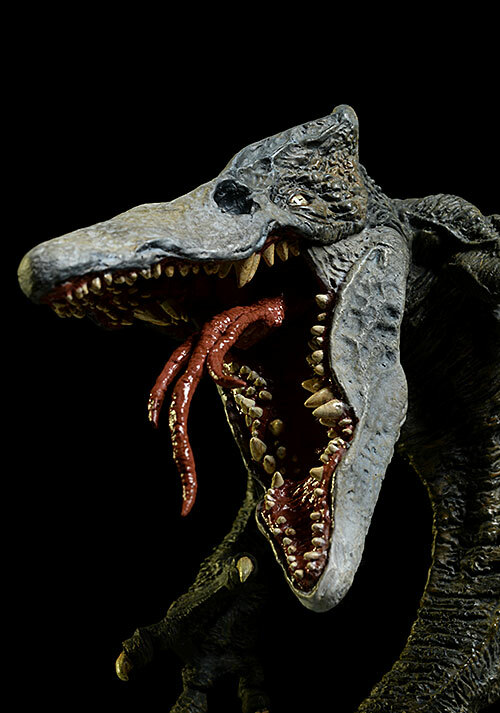 The teeth are better than some we've seen on larger figures, and the interior of the mouth is a slightly different shade than the tongue, allowing it to stand out. 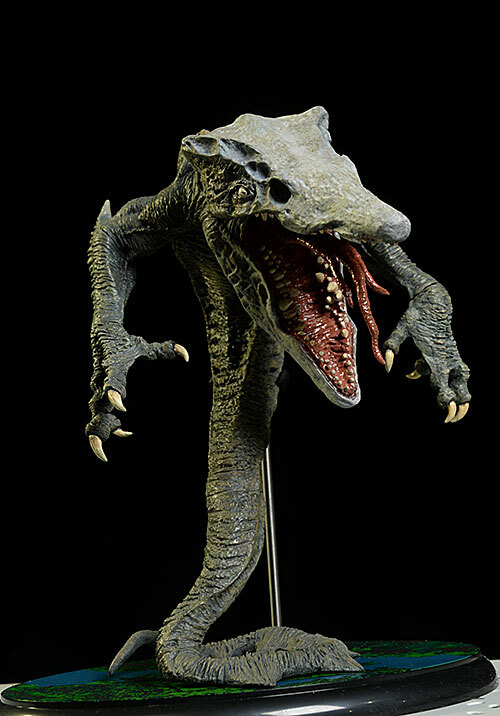 Like Kong, the detail work on the mouth of the Skullcrawler is excellent, perhaps his best feature in this category. The eyes, beady as they may be, are sharp and clean. There's not a ton of edges, but the claws are cleanly defined on the fingers, as are the teeth. There is something a little off about the color of the bone face, however. It's a little too dark, a little too gray for me. It's a minor nit though, with an otherwise impressive paint job. I'm including this category as an FYI only, not as an influencer on the Overall score. Since this is a new line for them, it's worth noting that yes, these are statues, and there is no articulation of any kind, regardless of what assembly seams you might see in photos. Statues don't usually come with accessories, so it's always a plus when you get any score in this category. I'm counting the bases as extras, since both statues can stand fine on their own without them. The bases are identical, with Skull Island stickers on a black plastic disk. The disk has a couple post holes. 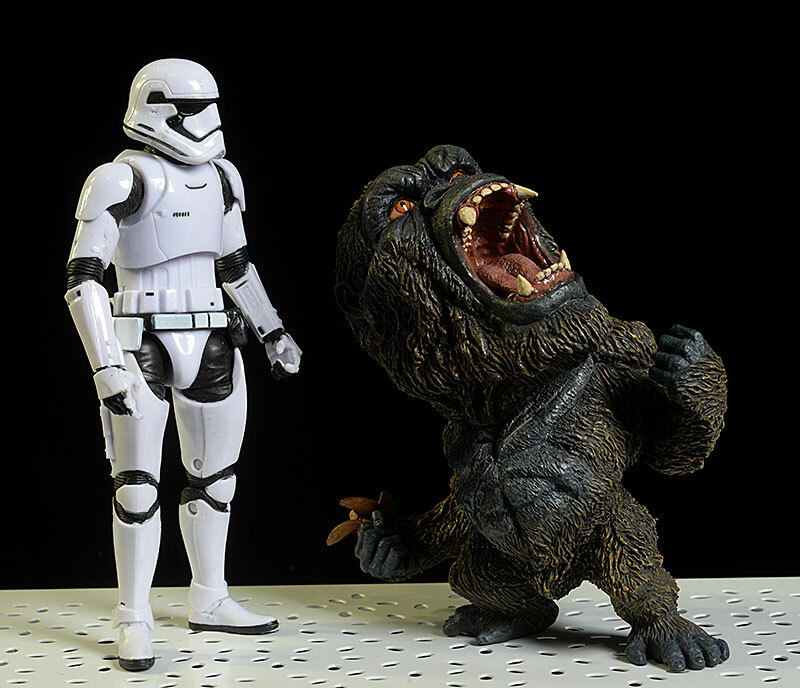 They aren't necessary for Kong, as he comes with a small black support that he can sort of sit on, and can be situated anywhere on the base (or shelf). There should also be a metal chain with the final release, to wrap around the right hand and arm of Kong. This early sample didn't include it. Skullcrawler has a more traditional metal support rod, with a black plastic rest sculpted to fit around his back. Again, it's not necessary to keep him standing, but it will ensure the thin tail doesn't wilt with time. Considering the price point on current Pop! figures, I'm not too plussed by the $50 - $60 price tag on these. 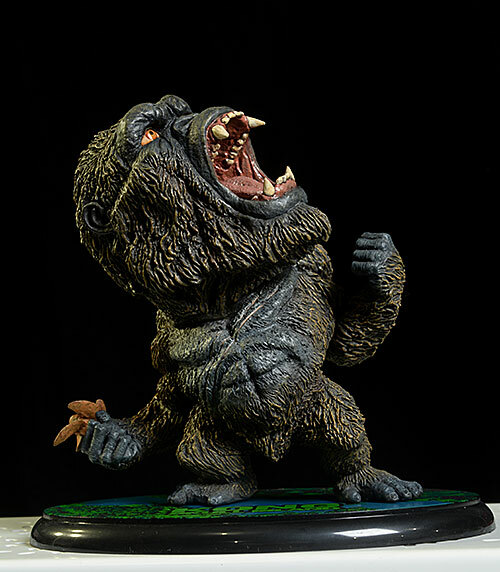 Star Ace is producing a variety of items for the Monsterverse, including a very cool looking 12" Kong. These new deformed designs are interesting, and should be popular with those into the style. 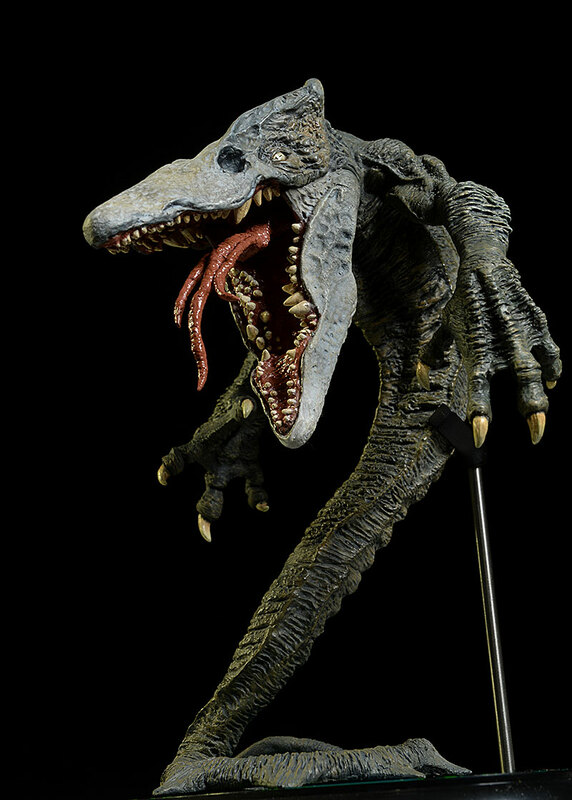 The sculpting detail and paint work are certainly well above the norm for this price point, and I'm hoping they continue it with the 2019 Godzilla film, considering all the excellent monsters they'll have to choose from at that point. 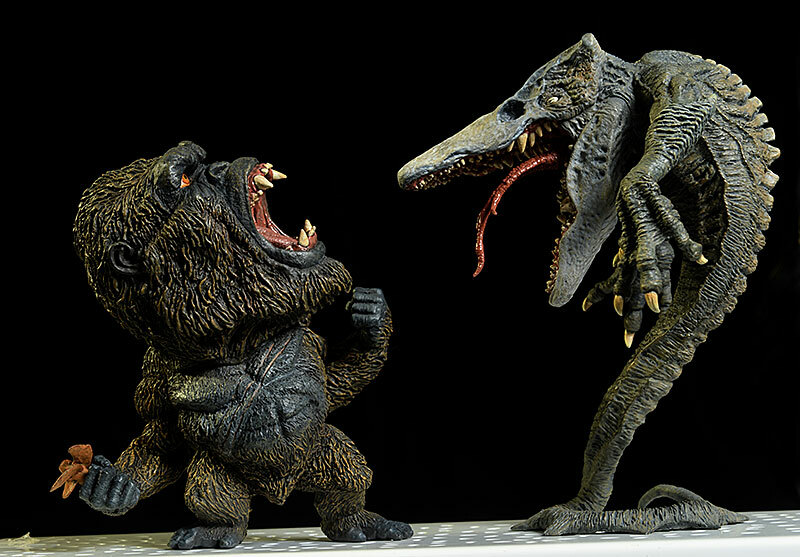 - has Kong on pre-order for $55, and the Skullcrawler for $60. There have been lots of great Kongs, but one of my favorites was the Mezco version, based on the Jackson movie. 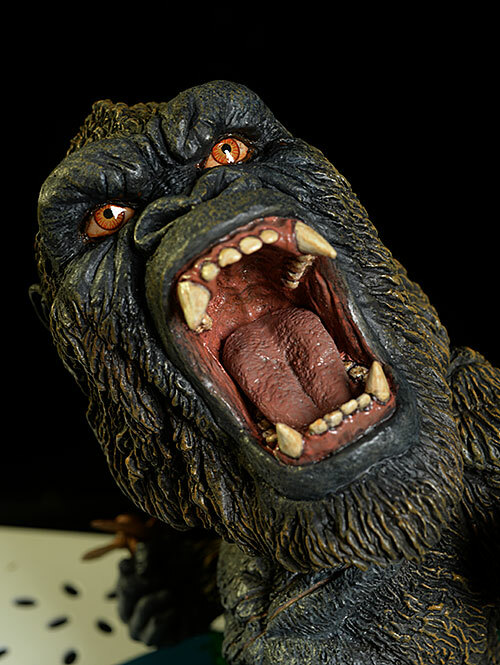 I also still have my original movie Kong from McFarlane Toys. This product was provided for the review by the manufacturer. Photos and text by Michael Crawford. This page copyright 2000 - 2018, Michael Crawford. All rights reserved.